Fluxes of organic matter (OM) from terrestrial ecosystems subsidize stream food webs, which support the production of ecologically and economically important species such as the sea lamprey Petromyzon marinus. Debris have been previously observed in the gut contents of sea lamprey ammocoetes, but their origin and/or the nutritional sources assimilated are still poorly known. We used carbon (δ13C: 13C/12C) and nitrogen (δ15N: 15N/14N) stable isotopes to identify the main OM sources supporting the production of ammocoetes in a tributary of the Minho River (NW-Iberian Peninsula). Ammocoetes δ13C and C:N values increased with length. Smaller individuals likely assimilated more 13C- depleted sources such as fresh or decaying plant material. The increase in the C:N values with length suggests that ammocoetes accumulate lipids to support their metamorphosis and recruitment into an adult animal. Ammocoetes smaller than 30 mm presented an unusual variability for both δ15N and δ13C values, with values varying between 3.2‰ and 17.8‰ for δ15N and between − 38‰ and − 25.5‰ for δ13C in the same sampling site. This suggests that factors such as organic pollution inputs or time to the first feeding may have contributed to the observed variability. Detritus from the adjacent riparian vegetation was identified as the main food source assimilated by sea lamprey ammocoetes. The stable isotope mixing model (95% CI) indicates that the relative contribution of decaying riparian plants detritus varied between 38–59% and 55–73% at the end of the summer decreasing towards the end of the winter (2–34%). The relative contribution of other terrestrial-derived OM (i.e. fresh riparian detritus and particulate OM with terrestrial origin) was only relevant (> 40%) at the end of the winter. 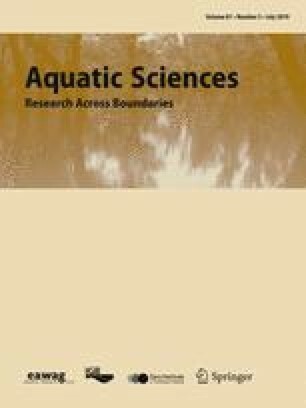 This study shows that there is a strong connectivity between the stream food web and the adjacent riparian ecosystem, and that protection of both riparian and catchment forest cover are essential to preserve terrestrial-aquatic linkages which can support the development of sea lamprey ammocoetes. Ester Dias and Maria L. Miranda made equal contributions to this work. We would like to thank the staff at Aquamuseu do Rio Minho for their collaboration during the fieldwork, to Rodrigo López for providing the map of the study area, and to Dr. Mark Kennard, Dr Stuart Findlay and two anonymous reviewers for their valuable comments and suggestions. This work was partially supported by the Strategic Funding UID/Multi/04423/2019 through national funds provided by Fundação para a Ciência e a Tecnologia (FCT, Portugal) and European Regional Development Fund (ERDF), in the framework of the programme PT 2020. All applicable international, national, and/or institutional guidelines for the care and use of animals were followed.